Find out why the dolphin swim is the most popular program at Ocean World! During your 30-minute dolphin interaction you'll dance, hug, pet and swim with the dolphins. Finishing with a spectacular dorsal fin tow, your dolphin swim is assured to be the most memorable highlight of your Puerto Plata vacation! For a fun way for the entire family to enjoy the breathtaking, once in a lifetime experience of an up close and personal dolphin encounter, book Ocean World's Dolphin Encounter Interaction Program! This program is suitable for all ages and offers guests the opportunity to touch, kiss, hug and dance with these beautiful mammals! This is a tour that should not be missed during your stay in Puerto Plata. Located on the top of Mount Isabel (2555 feet or 855 meters above sea), this cable car offers you the beautiful panoramic ocean view and surrounding areas of Puerto Plata. It is one of the picturesque and most impressive excursions that can obtain a tourist upon visiting the Dominican Republic. On top of the mountain you will find botanical gardens, a statue of Christ (similar to the one in Rio de Janeiro, Brazil), a restaurant and several souvenir shops. in addition, of course, to the breathtaking views of Puerto Plata and the surrounding ocean. Admission fee: 200 pesos (less than US $8). Beaches are the single greatest attraction in and around Puerto Plata. Its tourist zone includes a stretch of golden sand beaches estimated at around 300,000 square meters. Eleven kilometers of beach, reaching from Cofresi to Sosua are being developed into the needs of the most demanding traveler. The main beach for Puerto Plata is Long Beach, located just to the east, along the Malecon. Playa de Long Beach is the public, urban beach for Puerto Plata. Both Confresi and Costambar beaches are located west of Puerto Plata, and are now dominated by luxury resorts. The beaches in and around Puerto Plata are fronted by coral reefs, so you can dive and snorkel when the tides are good. In the vicinity of Puerto Plata lies Playa Dorada (golden beach), the beach has an amazing 24 km (15 miles) of white sand. Up and down the coast are other beaches like Cabarete, Boca de Cangrejo, Cano Grande, Bergantin, Playa de Copello, and Playa Mariposa. To the west of Puerto Plata is a favorite, the shaded Guarapitao Beach. Displays pieces taken from the amber mines in the Northerm Mountains with millennial fossils. The museum is located at Duarte Street #61, close to the Central Park. The building that houses the museum is considered a splendid sample of neoclassical architecture with Victorian influence. By the way it's open every day except Sunday, from 9 am until 5 pm. Tel. 809-586-2848. During January through early April, humpback whales return to the bay at Samana each year. The bay is about a 2 1/2 hour drive from Puerto Plata's International Airport, but is well worth a day trip or an overnight stay. Scuba divers will enjoy the sounds of the humpback whales! The World Wildlife Fund considers Samana Bay one of the best places in the world to watch whales. It offers something for everyone-the outer bay is where you might find aggressive males competing for the favors of willing females, and the sheltered inner bay is one of the most important humpback nurseries in the world. The Fuerte San Felipe (San Felipe Fort) is located on a small peninsula on the Bahia de Puerto Plata, the bay Columbus once had such high hopes for. The Fort is, in fact, the only vestige of Puerto Plata's colonial past. For a little admission fee, you'll be able to look in on a small historical museum, and the tiny cell in which the hero of the Independence movement, Juan Pablo Duarte, was briefly confined. You'll find a number of guides hanging around the entrance to the fort, who for a small fee, will give you a tour. Relax on a tour through the mountains on the way to Santiago, where you can visit a cigar factory. Santiago is the center of the cigar industry. Cigars are made individually by craftsmen, who roll as many as 300 a day. The Dominican Republic exports nearly 60 million cigars annually. The main markets for Dominican cigars are the United States and western Europe. There are several opportunities to visit cigar factories if you are visiting the Central region of the Dominican Republic. The city of Puerto Plata is lined by an oceanfront boulevard (Malecon) known for its open-air restaurants, shops, and nightlife. This is a scenic area to explore and enjoy Dominican culture. When in the city one can't help but notice the massive walls of Castillo de San Felipe, the oldest military fortification in the Americas. The area boasts large historic area with buildings dating back to the 1600's. While in this area it is definitely worth a tour of the amber museum. The museum includes samples of ancient fossils, some worth as much as $50k. Also take advantage of the rum factories in the area. These and other tours are available throughout the city of Puerto Plata. The north coast is a tropical oasis to visitors around the globe. Tours are provided by local Dominicans who know the area, the secret spots, and best times for viewing the landscape. About fifteen minutes from Puerto Plata is the Gri Gri Lagoon. The foliage and wildlife in this area is breathtaking and make sure to visit the river which is surrounded by mangroves. A visit to Puerto Plata would not be complete without going up to the peak of the mountain, Isabel de Torres. 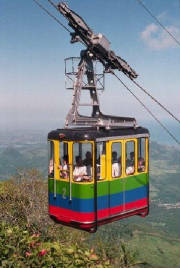 A short cable ride will take you up the mountains to see the gardens there and the panoramic view. That is where the famous statue, Christ a la Rio de Janiero stands. A few hours from Puerto Plata is a region called Monte Cristi. Here, you will find the El Morro National Park and various bird species. El Morro is Known for birdlife, and you can see the frigate bird, American kestral, American oyster-catcher, wood stork, plovers, ruddy turnstone, willet gullis and brown tody, among others. Many major tour companies have main or branch offices in or near Puerto Plata. Some of them can even take you as far as the Samana peninsula, and will organize helicopter rides, boat trips, national parks tours, and water sports. The tourist information office is on the Malecon #20 in Puerto Plata. Ocean World Adventure Park, Marina & Casino is the most complete entertainment complex of the Dominican Republic, located in Cofresi Beach, just 3 miles west from the town of Puerto Plata. This entertainment complex is made of an elegant Marina, a unique marine park that allows visitors to interact with marine mammals and the outstanding building where our clients will have the opportunity to enjoy restaurants, bars, and theatre with live dance show, casino and a disco-lounge.